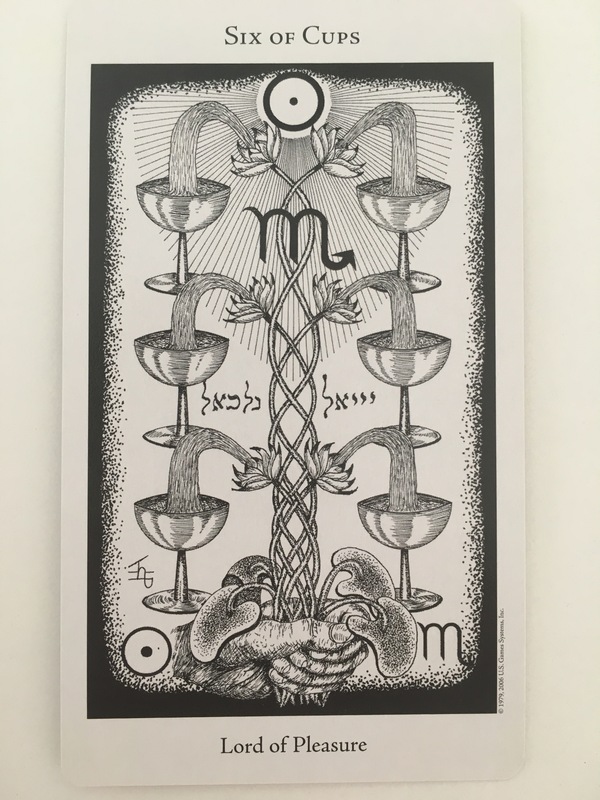 Card: Six of Cups – from The Hermetic Tarot by Godfrey Dawson. Message from Erin: Okay, full disclosure, I really struggled with the cards today. Normally things flow super easily and I don’t resist the messages that come each week, but this week I just wasn’t having it. 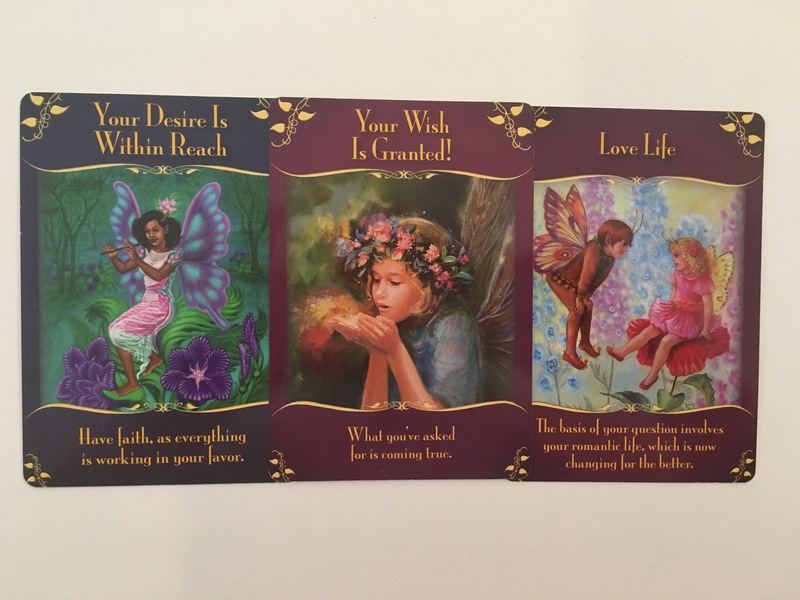 I was actually clearly guided to pull a card from Doreen Virtue’s Magical Messages from the Fairies deck. I pulled one, got mad, pulled another and got annoyed and pulled a third and still didn’t like it! And believe or not I was super annoyed that the cards were all similar in theme and I was annoyed at the Faeries for being so damned positive! Haha! I mean, how dare they be so positive when things feel so the opposite right now. Well, at least they feel that way to me. Things feel difficult! And the energy right now is so wacky and off putting. The Faeries, of course humoured me when I declared I was going to pick from my “dark tarot”. And of course, the card I picked has the exact same message as the other three cards. Joke is on me! Anyway, lesson learned! I should have just stuck with the first card. Message from the Faeries: In spite of all the intense energies and negative things happening in the world, and despite your own struggles, things are really looking up for you this week and this a time where some things you’ve been working towards are really going to work out. We will go so far as to say: Things are going to work out to spite of all the dark and weird things going on this week. Good things can and will prevail! We aren’t going to smother you with too much positivity because it might come across as unreal or disingenuous, but we hope this message of light will shine through the dark. Your cup(a) aren’t empty, they are flowing! 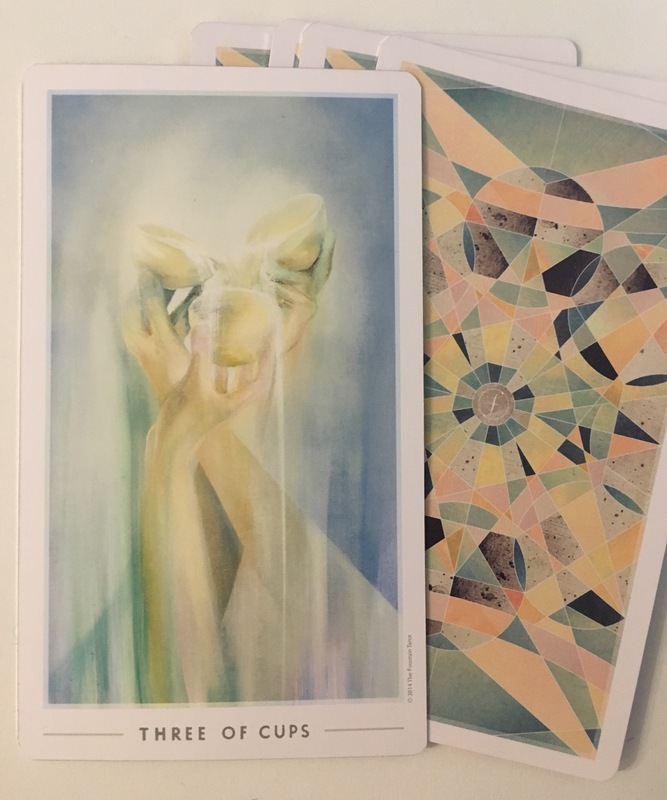 Card: Four of Cups – from the Tarot of the Holy Light by Christine Payne-Towler. Message from the Faeries: This New Moon has caused a bit of a ruckus. 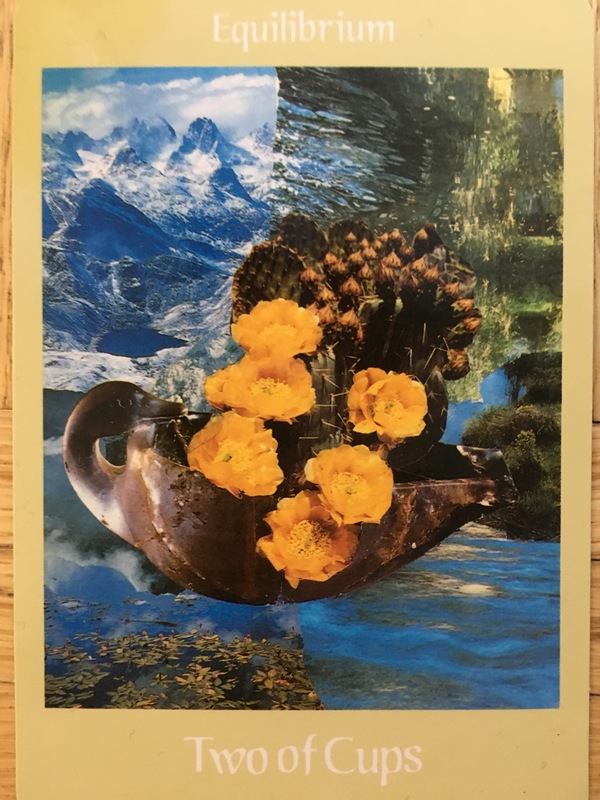 If you are feeling like your feathers are bit ruffled, it’s because this New Moon has forced you to face the facts there are a few things in your life that you just aren’t happy with right now. It could be anything from your job, a friendship or where you live. Whatever it is that bothering you, the bee in your bonnet just won’t stop buzzing. The current celestial events have created a wave of energy where you desire change or something new. 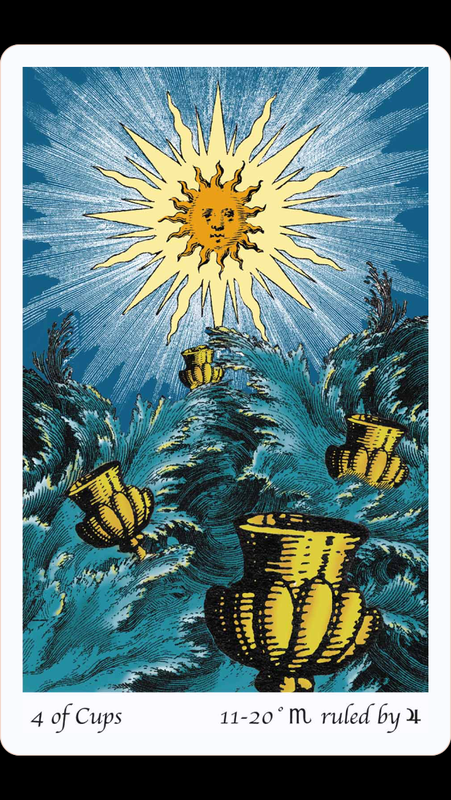 Like the cups being bounced around by the waves in this card, you feel yourself being jossled about emotionally. Your boat is being rocked, and you want to head for calmer waters. Do not be afraid. This is just a temporary feeling. In fact, you are being presented with a tremendous opportunity to create the changes you desire. You can use these energies that are causing the waves to propel towards that which you desire. Fortune, which is represented by The Sun on this card, is shining upon you. Don’t fight the currents you are tangled up in, but rather go with the flow of it and they will take you to your desired destination. You will soon leave behind all the things in your life that are no longer serving you. Who said the journey would be an easy one?